It's time to get our hands in the rich dirt and plant! In honor of planting season, and well...just because...I am giving away this lovely apron, some of my favorite flower seeds, and a sweet little leather bound garden journal. I wear aprons in the garden and they are such a great way to keep clean, have a place for snips, seeds, and gloves. I found this delightful chambray fabric and designed a half apron with three perfect pockets and extra long ties that can be wrapped around your waist and tied back in front. The seeds are some of my favorite cutting flowers! Zinnia, Sweet Peas, and Hollyhocks from my own garden. I have this small journal and love it for keeping track of when I planted, and how things are looking in the garden every few weeks. It is the perfect size and shape! If you would like a chance to win, just leave a comment below WITH a way for me to contact you! I will select a winner Monday, April 20th. If you are so kind to share this post via social media leave another comment for an extra chance to win! A lovely giveaway....beautiful chambray, I would love to find some like that....seeds for my very favorite flowers....and a garden journal! Oops Contact info left out..
What an adorable apron! That is such a great idea to wear one while gardening. What a sweet giveaway..love the cute items you have selected. Love reading your blog. You are such an inspiration!!! Such a pretty apron. I am so excited for spring! Thank you for the giveaway!! What a lovely apron. I am so excited for spring! Thank you for the giveaway! I would love a chance to win your beautiful apron with seeds and journal. This spring I am embarking on a new venture and getting chickens! I would hope to fill those pockets up with eggs along with some cut flowers from my gardens. Thank you! Lovely give away...would love to win. I'm following your lead this year and planting a cutting garden. We're on the hunt for an old truck bed, too, so we can emulate the lovely stand you made last year. Here's to spring and the promise of so many beautiful things to come. Thanks for the opportunity to win this little gardening ensemble. Love your blog and that apron! Sure would love to have the beautiful apron! Thanks for the giveaway. I would love to win. I enjoy gardening and love planting flowers that I can cut and bring in the house to enjoy. Thanks for being so generous. Such a wonderful giveaway! I read your blog for a few years now. I love everything about it, especially all these beautiful photos. I hope that there's a chance for me to win, I live in germany. How lovely! I'm awash in veggie seeds, but flowers would be a welcome addition for this beginning gardener. Thanks for the giveaway! Love the apron! Your blog is very inspiring to me. It helps me see the potential in my own place. Thanks for sharing some of your favorite things. Thanks for much for such a great giveaway! What a great give-away! I would love to plant some cutting flowers! It is such a lovely gift. What a lovely giveaway. I am looking forward to getting my hands in the dirt soon! My boots and hat are ready, and the apron would be a great addition. What a great give-away! I would love to plant some cutting flowers. I think I finally figured out how to post a comment on here! Please enter me in your giveaway. Your gardening items could not come at a better time for me!! I shared a giveaway link on my blogger page also! Have been following your blog for several months now. Love the photos! They remind me of times spent with my children. Now we're in the grandparent phase & looking forward to doing the same things with the grandsons. I've never posted anything before, but your lovely gift is too tempting. So, here it is...MY 1ST POST! Have been following your blog for several months now. I love the pictures! Reminds me of times spent with our children. Now looking forward to doing some of the same things with the grandsons. I've never posted anything before, but your lovely gift is too tempting. So, here it is...MY 1ST POST! You are so talented!! I struggle with staying clean while gardening... I live in Georgia and the clay is red, and stains everything. Oh well - it is still fun to play in the dirt! My contact info is rebekahulsaker@comcast.net. Hi Julia! I think i have told you before how beautiful your home and property is, i just love reading about your garden and seeing the bounty you grow! Can't wait to see how the new "old" truck display looks with all those gorgeous zinnias on it!! would love to be in on the giveaway too!! I love aprons! and journals! and flowers! ---a perfect combination! You have been a favorite of mine over the years. Your blissfully content and grateful heart have been a navigational guide. Cannot wait to start in NJ what a great giveaway. So sweet of you!! I shared your giveaway on Pinterest. I would be styling in my garden with that apron...Lovely!! Those are some of my fav flower seeds , too!! I journal about plantings and how they do, also. What a great give away. I follow you by email and forward to some friends and my daughters. I found your blog through A Lettered Cottage. I think I will feel very at home here since I live on a farm too and love it! I've never used a gardening apron. It makes so much sense to keep your small tools right at hand. Thanks for the contest. Cute and handy idea with the apron! Can't wait to plant here but will still be awhile. Hope we get those seeds for the bees! Looking forward to your garden photos! This is exactly what I need for my garden. I was thinking the other day about how my grandmother always wore an apron when she tended her flowers. Thanks so much for the chance. the fabric is beautiful, and your timing is perfect - would love to win your giveaway. won't be able to plant much for a bit here in NE ohio, but i'm looking forward to just getting all the cleaning up and organizing and fertilizing done this weekend. i do enjoy your blog, especially the cow and calf photos of late. best wishes for good weather this year, and healthy animals and crops and family. So beautiful!! Thanks for your generosity. 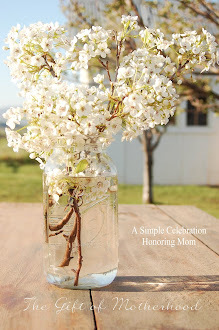 What a fun giveaway for this time of year ~ the garden is calling my name right now! Thanks so much at a chance at winning your lovely gifts. Amy M.
I love your website and enjoy your posts about gardening, cooking, and sewing. I come from a cattle ranch, so I appreciate your lifestyle. I am delighted to have found your blog. I wish I could serve you some Darjeeling tea in a vintage teapot I bought recently. Winning an apron from you would be wonderful. Here's hoping! Thanks so much for a great giveaway! Love getting out in the garden. I'm itching to get out and start planting! What a kind heart you have, blessings. Sweet apron! The seeds and journal are nifty too. I'm itchin' to start gardening....when it warms up a little more. This is my first year of planting some cutting flowers! I'm excited to fresh bouquets for my own table and to share! The apron is beautiful!